2011 saw the publication of Margaret Atwood's (mostly) non-fiction collection, In Other Worlds: SF and the Human Imagination. No, the book is not an ode to The City by the Bay, the SF in the title represents a certain misunderstood genre: a genre that dominated the author's formative years in Northern Quebec, where her only friends were books and trees; a genre she wouldn't fully explore in her own writing until her sixth novel, 1987's Arthur C. Clarke Award winning The Handmaid's Tale; a genre she wouldn't revisit for another 18 years, when Oryx and Crake was published; a genre whose very definition she would debate, to the disapproval of critics and fans. But science fiction by any other name would have been as big an influence on Atwood. And despite nomenclatural semantics, it is the genre where she has achieved the most success as a writer. It is also a genre of new beginnings. Science fiction offers less rigidity than realism, allowing for the creation of brave new worlds, whether through actual worldbuilding or the clean slate provided by dystopia. Atwood has engaged in the later, rebooting the world as we know it not once, but twice. The first time, in the aforementioned The Handmaid's Tale, takes place after, and is the result of a staged terrorist attack by military extremists. The United States government is overthrown, replaced by a society where women are subjugated as servants and breeders, or if they are lucky, just wives. While The Handmaid's Tale is about what society has become, The Maddaddam trilogy...speculates about what society will become. While The Handmaid's Tale is about what society has become, The Maddaddam trilogy, which begins with 2003's Oryx and Crake, speculates about what society will become. In this case, it is in the wake of a near planet-wide catastrophe, which leaves Jimmy (aka Snowman) the last man on earth. He's not alone, however. He plays reluctant prophet to a genetically modified group of humanoids called the Crakers. The Crakers were bio-engineered by Jimmy's best friend, a timid genius called Crake (aka Glenn). Technically they were the property of the RejoovenEsense Corporation, where Crake was supposed to be working on the "problem" of mortality, but in reality they were his Adam and Eve, and he cast himself in the role of God. The story of Jimmy and Glenn is told through flashbacks as Jimmy navigates the harsh post-catastrophe life. Oryx and Crake makes a brilliant standalone novel, even though it clearly leaves room for a sequel. And while I prefer the open-ended nature of that book, I wasn't going to say no to more. Enter The Year of the Flood, published in 2009. Atwood said the reason she wrote the novel was because people were always asking her what happened after the end of Oryx and Crake. But instead of giving everyone an answer, she decided to start the story all over again and tell it from a different point of view. The result is more of a companion piece than a true sequel. The Year of the Flood follows two women who have also survived the "Waterless Flood," and fills in a lot of the narrative blanks of the first novel via extensive flashbacks. For better or worse it broadens the scope of the mythology, creating connections between characters where there weren't any before. Atwood ostensibly re-writes the first book by introducing characters and motivations that didn't previously exist. These act as a reversal would in a mystery or a thriller, using new information to change the way we think about what we thought we knew. 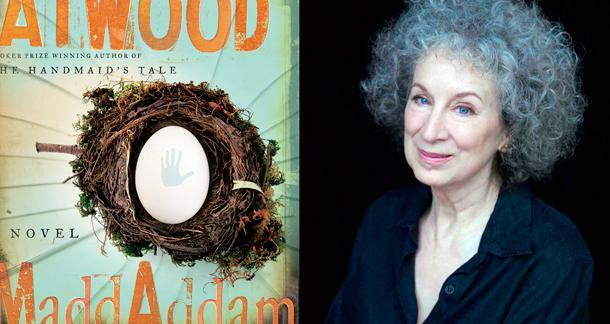 Even though Atwood gives us a new beginning in each of these novels, it is not until Maddaddam, the final installment of the trilogy, that she truly explores the theme of starting over. And even then, she poses the questions but doesn't give the answers. Questions about creation, the infallibility of "God," and the evolution of religion. She does this once again by flashing to the characters' pasts, focusing on backstory to expand the world's mythology even further. At this point, the narratives of Oryx and Crake and The Year of the Flood have converged. Jimmy and the Maddaddamites (the survivors introduced in The Year of the Flood) are united in the day to day struggles of dystopian life. The Crakers, however, those Adam and Eve's of the new world, are more preoccupied with where they came from than where they are going (much like Atwood) and demand nightly stories of life before "the Great Rearrangement." These remnants of the old world, knowledge of good and evil, taint the Crakers' so-called fresh start. In In Other Worlds..., Atwood says that utopia and dystopia "each contain a latent version of the other." In my review of that book, I questioned whether this meant anyone trying to make the world a better place is simultaneously contributing to its downfall, be it through science, religion or activism. Based on the "reveals" presented in Maddaddam, certain characters contribute to that downfall intentionally, believing destruction to be necessary for creation. You can't start from scratch without eradicating what came before. But can you ever truly wipe the slate clean? In Oryx and Crake, Glenn tries to create the perfect humans with the Crakers, but since humans are inherently imperfect, things do not go as planned. Even though Glenn tries to eliminate man's propensity towards religion, he can't eliminate the Crakers' curiosity. And by exercising that curiosity, their creation myths are born. Not counting the flashbacks, the majority of Maddaddam takes place in a short span of time, just months after the Waterless Flood. At this point the ramifications of the world's reboot are not yet fully apparent. For the amount of speculation that comes before, it is the end of the trilogy where the story really begins. And as with any new beginning, it is impossible to dictate where the story will lead. Full of scathing satire and unparalleled wit, Maddaddam is a satisfying conclusion to what may be Atwood's crowning achievement as a writer, and the auspicious beginning of an entirely new world. Must have this. I love her books.